Eat, sleep and surf your way through tropical Indonesia in 2018 with Kima Surf Camps Bali! Been having those blue crush surfer gal/guy vibes or dreaming of an island getaway? There is this funky little company making both those dreams come true… Kima Surf Camps in Bali, a leading organisation in sustainable surf camps. Kima Surf Camps offers all-inclusive stays that allow you to explore the island, eat, make new friends and be on your way to becoming a pro surfer. And hey if your goal isn’t to be in the WSL (World Surf League) but more achieve that beautiful sun streaked locks that only surfers embody, that’s totally ok too. Kima’s goal is simple; to create a community of like-minded people who see surfing as a lifestyle. It’s safe to say that this goal is easily achieved by the amazing crew at Kima. When you're starting out on the beginner end of the surfing spectrum, it can be hard to know what kind of waves are suited to your style, and where to find them. Making your surfing woes and worries wash away*, the team here do all the hard work in finding the perfect location, guides and equipment for you to spend maximum time surfing and zero time researching. *Pun not intended. Optional Surf lessons run from 6.30 am to 3.30pm for all skill levels and a variety of waves, locations and trips. You can sign up into small divided groups depending on your surfer level, and leave all the rest up to the coaches. There is up to 16 different Surf adventures you can partake in each day, allowing you to get in a morning surf session and afternoon session. Each trip is thoroughly thought out beforehand, and the team take into consideration wave size, tides, winds etc. so there are a lesson and trip to suit everyone. The surf vibes don’t stop there; Feeling stoked on your wave maneuvering, watch your self on the big screen in your real life blue crush scenes for video analysis 3 nights a week. Sit back and admire your beautiful surf stance, or lack thereof, while you cheer in support of each other’s great rides, and giggle at mishaps. It’s a fun way to make friends and improve your surfing. Your arms have turned into jelly, and you got yourself a nice little bout of surfer rash (or chafe) put away the Vaseline and relax by the pool with a cocktail instead. You might even feel like exploring a little bit so it’s easy enough to get the team to organise a day trip for you to some cool sites such as temples, volcanoes and snorkel sights. You can surf as little or as much as you want, so when your arms and legs are sore and you need a rest, that’s totally sweet. The whole day is up to you, it’s just a great luxury of having everything at your fingertips for when you may want it. Unlike other surf camps which can be expensive, Kima is super affordable and has a variety of sleeping arrangement to suit everyone. Keep up that backpacker appearance in a pretty luxury dorm and meet like-minded travellers. 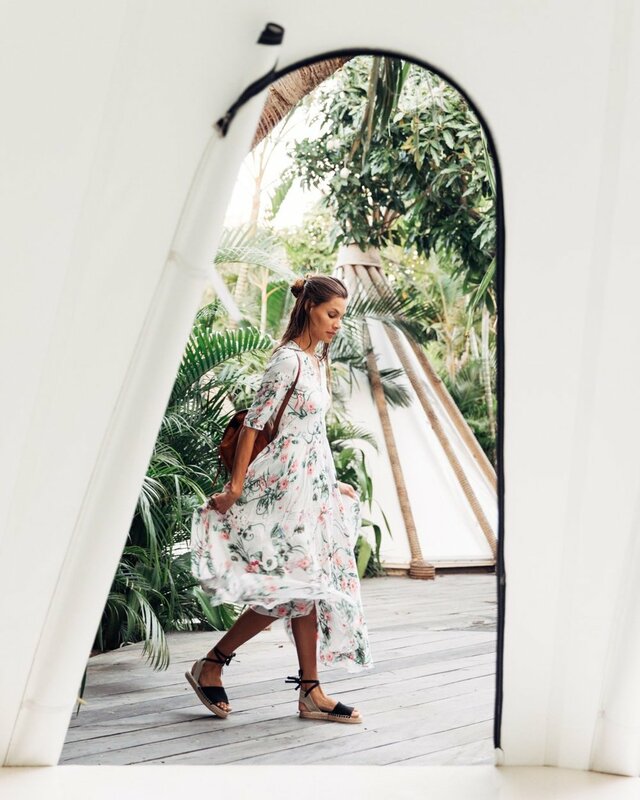 You can also camp out in a perfectly luxe meets boho tipi by the pool and make your friends envy your totally cool camp snaps. If you want the full resort feel, book into one of the double room suites with calming white and blue colour schemes. With locations in Seminyak, Green Bowl, Padang and Canggu you’re certainly able to find the perfect match for your surfing safari. The great locations of the resorts mean that if you want to explore your local surrounding for some lunch and dinner all are within a close distance also. Breakfast is included which means you can get that extra little sleep in before you hit the waves. With an array of fresh juices, a mix of western and Indonesian dishes there’s hardly room to get bored of the menu. With the rise of tourism in Bali, it’s sad to see the increase in rubbish and pollution attached to this. The guys at Kima are trying to stop or at least minimise the impact that people and plastic are having on the environment. Alongside beach clean-up days, the resort is 100% plastic free. Upon arrival, you are able to choose a stainless Steel water bottle that you can refill at the water stations around the grounds. The restaurants have opted for glass straws and glass storage containers. If you wish to go shopping Kima will also loan you a material bag, so there’s no need for plastic ones. It’s so epic to see a group of people leading the way in environmentally friendly and sustainable resort options. So a big high five to that. And with that, we’re out for a Surf to practice all our new found tips. However, if that salty ocean feeling has been itching away at you for some time, I suggest you go “get the feet wet” as they say and indulge your self in the luxury of a super epic surf retreat. See you when you’ve got that sun-streaked hair and tanned cheeks. Ciao.